The Sayre Family eggnog recipe. Unfortunately, my North Carolinian family has a far more complicated eggnog tradition. The secret recipe dates back four generations and years of sticky counters. 2) It’s insanely thick, like fluffy or foamy. 3) In my Mom’s words: It’s pretty potent stuff (there are three fifths of alcohol in the 2.5-gallon total yield). For me, it just doesn’t feel like Christmas without the Sayre-family ‘nog. Here is the dilemma, though: 'nog is perishable, so you can’t send it in the mail. Also, my mom just is not ready to hand down the recipe. The photo above is all I'm allowed to see of it to date. So began my quest to find something that could tide me over. Listen to some of the adventure below. First I tried coquito, a Puerto Rican holiday drink that my friend Danny Rivero makes every holiday. Danny’s family is Cuban, but some made it to Miami via Puerto Rico. He says coquito is better than the Cuban version, Crème de Vie (the jury is out on that one). In his quick-and-dirty version of the family recipe, he puts in a blender a can of condensed milk, a can of evaporated milk, a can of coconut milk, and a can’s worth of white rum. Not great for you, but good for the soul, says Danny. Then adds some cinnamon and nutmeg. It's delicious, sweet and creamy, but it's not the Sayre Family Nog. So on to the next candidate: local businessman Jean Mapou’s Kremas Mapou. It's the sale of the Haitian elixir that actually supports his small bookstore in Little Haiti. He says the tradition is to serve it with cake around the holidays, but he sells it year-round because some people buy little bottles to give away at their weddings or birthdays. Of course, he’s tight-lipped with his family’s recipe. All he says is there is a special imported condensed milk in it, along with evaporated milk, manila, Haitian spices and rum. The recipe comes from Mapou’s wife’s mother’s mother (like with a lot of recipes, the origins are a bit fuzzy). Kremas Mapou is really thick and delicious, but still not the Sayre Family Recipe. One last contender: Peruvian algarrobina, specifically the Murriel family's algarrobina. Federico Murriel, father of our digital editor Maria Murriel, shared his sister's recipe. The drink gets its name from algarrobina, a syrup made from the black carob tree (called algarrobo​ in Peru), and it includes egg, evaporated milk, condensed milk and pisco. The syrup Federico uses comes from his tiny hometown in Peru -- he says it has to be the syrup made there because it's the best one. Maria says they don’t actually drink this during Christmas in Peru (it's summer in December in the Southern Hemisphere); it’s a tradition the Murriels started when the family moved to the States. Back home the drink is usually too thick to enjoy in the heat. I have to admit, the texture and much of the flavor is pretty close to the Sayre Family Nog, but it’s not the Sayre Family Nog. 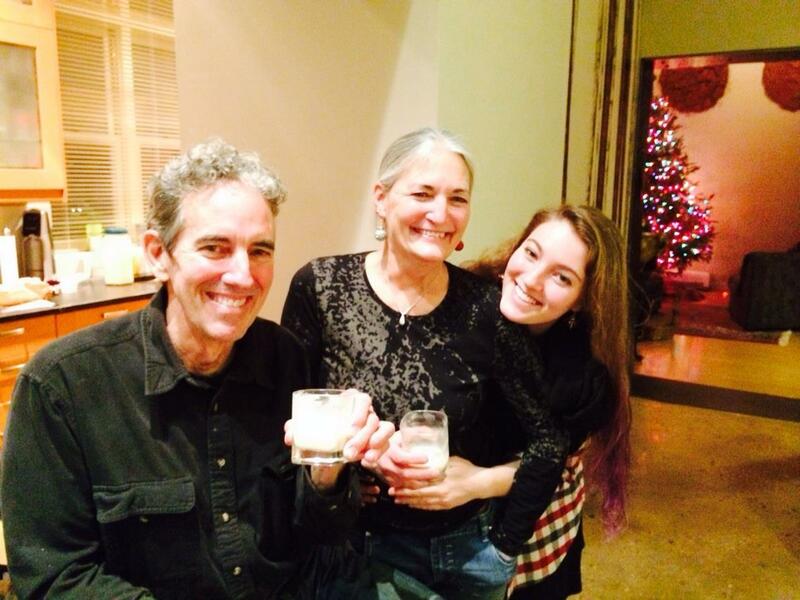 Happy Holidays from my family, drinking 'nog without me. Honestly, even from the start, I knew trying to find some surrogate to the Sayre Family Nog would be a lost cause. My mom says it’s because I’m biased. That is a given. Holiday seasons are about tradition, which compels you to go around and try a bunch of different kinds of “eggnogs” hoping to find something familiar. What the Murriel family, the Riveros and Jean Mapou have all done is take parts of a tradition and remixed it— sometimes in a blender — and they made it work with their new lives, away from where the tradition began. Over time, they changed what was familiar. They changed the tradition. When my mom relinquishes, I’ll eventually start making the Sayre family recipe. Then I, too, will put my own touch to it. Maybe a splash of coconut milk, a drop of algarrobina or a fifth of Haitian rum. Cheers to you this holiday season with what every kind of ‘nog your family makes.